This article is about the company. For the person, see John Deere (inventor). 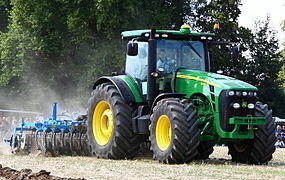 For the tractor, see List of John Deere tractors. 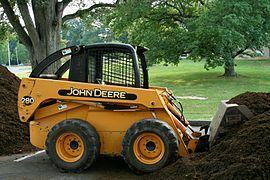 John Deere is the brand name of Deere & Company, an American corporation that manufactures agricultural, construction, and forestry machinery, diesel engines, drivetrains (axles, transmissions, gearboxes) used in heavy equipment, and lawn care equipment. In 2018, it was listed as 102nd in the Fortune 500 America's ranking and was ranked 394th in the global ranking. The company also provides financial services and other related activities. Deere & Company is listed on the New York Stock Exchange under the symbol DE. 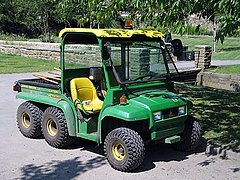 The company's slogan is "Nothing Runs Like a Deere", and its logo is a leaping deer, with the words 'JOHN DEERE' under it. Various logos incorporating a leaping deer have been used by the company for over 155 years. Deere & Company began when John Deere, born in Rutland, Vermont, USA on February 7, 1804, moved to Grand Detour, Illinois in 1836 to escape bankruptcy in Vermont. Already an established blacksmith, Deere opened a 1,378-square-foot (128 m2) shop in Grand Detour in 1837, which allowed him to serve as a general repairman in the village, as well as a manufacturer of large tools such as pitchforks and shovels. Small tools production was just a start; the item that set him apart was the self-scouring steel plow, which was pioneered in 1837 when John Deere fashioned a Scottish steel saw blade into a plow. Prior to Deere's steel plow, most farmers used iron or wooden plows to which the rich Midwestern soil stuck, so they had to be cleaned frequently. The smooth-sided steel plow solved this problem, and greatly aided migration into the American Great Plains in the 19th and early 20th centuries. In 1842, Deere entered a business partnership with Leonard Andrus and purchased land for the construction of a new, two-story factory along the Rock River in Illinois. This factory, named the "L. Andrus Plough Manufacturer", produced about 100 plows in 1842 and around 400 plows during the next year. Deere's partnership with Andrus ended in 1848, and Deere relocated to Moline, Illinois, to have access to the railroad and the Mississippi River. There, Deere formed a partnership with Robert Tate and John Gould and built a 1,440-square-foot (134 m2) factory the same year. Production rose quickly, and by 1849, the Deere, Tate & Gould Company was producing over 200 plows a month. A two-story addition to the plant was built, allowing further production. Deere bought out Tate and Gould's interests in the company in 1853, and was joined in the business by his son Charles Deere. At that time, the company was manufacturing a variety of farm equipment products in addition to plows, including wagons, corn planters, and cultivators. In 1857, the company's production totals reached almost 1,120 implements per month. In 1858, a nationwide financial recession took a toll on the company. 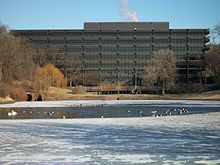 To prevent bankruptcy, the company was reorganized and Deere sold his interests in the business to his son-in-law, Christopher Webber, and his son, Charles Deere, who would take on most of his father's managerial roles. John Deere served as president of the company until 1886. The company was reorganized again in 1868, when it was incorporated as Deere & Company. While the company's original stockholders were Charles Deere, Stephen Velie, George Vinton, and John Deere, Charles effectively ran the company. 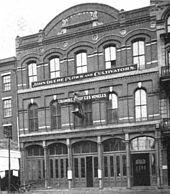 In 1869, Charles began to introduce marketing centers and independent retail dealers to advance the company's sales nationwide. This same year, Deere & Company won "Best and Greatest Display of Plows in Variety" at the 17th Annual Illinois State Fair, for which it won $10 and a Silver Medal. Increased competition during the early 1900s from the new International Harvester Company led the company to expand its offerings in the implement business, but the production of gasoline tractors came to define Deere & Company's operations during the 20th century. In 1912, Deere & Company president William Butterworth (Charles' son-in-law), who had replaced Charles Deere after his death in 1907, began the company's expansion into the tractor business. Deere & Company briefly experimented with its own tractor models, the most successful of which was the Dain All-Wheel-Drive, but in the end decided to continue its foray into the tractor business by purchasing the Waterloo Gasoline Engine Company in 1918, which manufactured the popular Waterloo Boy tractor at its facilities in Waterloo, Iowa. Deere & Company continued to sell tractors under the Waterloo Boy name until 1923, when the John Deere Model D was introduced. The company continues to manufacture a large percentage of its tractors in Waterloo, Iowa, namely the 7R, 8R, and 9R series. According to information released by the company at the time of the event, John Deere dealers and key employees came to Dallas via the "largest commercial airlift of its type ever attempted." During the 24 hours leading up to the event, 16 airlines brought Deere employees and sales people from all over the United States and Canada to Love Field in Dallas. Bill Hewitt, then chairman and CEO of Deere & Company, welcomed the dealers and introduced the new tractors. Hewitt told the guests they were about to see "a line of entirely new tractors – completely modern in every respect – with outstanding features not duplicated in any other make of tractor." In addition to the advanced engine technology, the "10" series tractors offered many other upgrades from the older two-cylinder models they replaced, including significantly higher horsepower-to-weight ratio, advanced hydraulics, more convenient and comfortable operator stations, and many other improvements. Of the "10" series John Deere tractors introduced in 1960, the 4010 was by far the most popular, with more than 58,000 units sold from 1960 to 1963. The success of the "10" series John Deere tractors, led by the 4010, helped propel John Deere from a 23% market share in 1959 to 34% by 1964 when the 4020 was introduced, making it the top manufacturer of farm equipment in the United States. In 1973, Deere introduced its new 'Sound Idea' tractors, the 4030, 4230, 4430, and 4630. 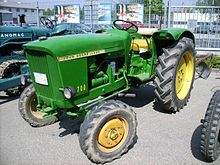 While these tractors were mechanically similar to the New Generation tractors they replaced, and the 4230, 4430, and 4630 used a 404-cubic-inch displacement engine like the 4020, they featured redesigned sheet metal and most importantly they were available with an optional completely integrated operator's cab that John Deere called the Sound Gard body. This insulated cab that included a roll-over protective structure had a distinctive rounded windshield and came equipped with heat and air conditioning, as well as speakers for an optional radio. An 8-track tape player was also available as an option. 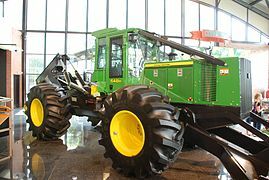 The 5020 was replaced by the very similar 6030 and continued in production with New Generation styling until 1977 when the 30 Series tractors were replaced by Deere's 'Iron Horses' series that included the 90-hp 4040, 110-hp 4240, 130-hp 4440, 150-HP 4640, and 180-hp 4840. The 4240, 4440, 4640, and 4840 featured a new 466-cubic-inch displacement engine, and improvements to the cab including an optional hydraulic seat for a smoother ride. The Sound Gard body and Power Shift transmission were standard equipment on the 4840. In 1983, Deere introduced the 4050, 4250, 4450, 4650, and 4850. These tractors were essentially the same machines as the Iron Horses they replaced, but with significant upgrades. They offered a new 15-speed Power Shift transmission, and were available with optional mechanical front-wheel drive featuring caster action for better traction and a tighter turning radius. They also featured cosmetic upgrades, including a new light brown cab interior, instead of the black interior on previous models. These tractors were followed by the mechanically similar 55 and 60 series tractors before they were replaced by the Deere's completely redesigned 7000 and 8000 series tractors in the early 1990s. As of 2018[update], Deere & Company employed about 67,000 people worldwide, of which half are in the United States and Canada, and is the largest agriculture machinery company in the world. In August 2014, the company announced it was indefinitely laying off 600 of its workers at plants in Illinois, Iowa, and Kansas due to less demand for its products. Inside the United States, the company's primary locations are its administrative center in Moline, Illinois, and manufacturing factories in central and southeastern United States. As of 2016[update], the company experiments with an electric farm tractor. The logo of the leaping deer has been used by this company for over 155 years. Over the years, the logo has had minor changes and pieces removed. Some of the older style logos have the deer leaping over a log. The company uses different logo colors for agricultural vs. construction products. The company's agricultural products are identifiable by a distinctive shade of green paint, with the inside border being yellow. While the construction products are identifiable by a shade of black with the deer being yellow, and the inside border also being yellow. 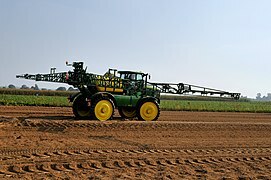 John Deere's license covering the internal software on tractor control computers does not allow users to modify the software. This prevents repairs by farmers and creates a monopoly for John Deere dealerships. John Deere claims user repair is forbidden by the Digital Millennium Copyright Act, through bypassing of digital rights management. Groups including the Electronic Frontier Foundation have criticised this activity. Some farmers use Ukrainian versions of John Deere software to circumvent restrictions on repair. 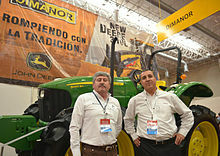 John Deere representatives at the Encuentro Empresarial Coparmex in Chihuahua, Mexico. Green Magazine is a publication devoted to John Deere enthusiasts. It was begun in November 1984 by Richard and Carol Hain of Bee, Nebraska. ^ a b c d e f "DE Income Statement". NASDAQ.com. Retrieved 31 March 2018. ^ "Deere". Fortune. Retrieved 2018-11-10. ^ "John Deere Collectors Center Tractor and Memorabilia Auction June 29 – 30". Dispatch-Argus-QCOnline. Retrieved 2017-10-17. ^ a b c "A Brief Look at John Deere Combine History: 86 Years of Evolution". blog.machinefinder.com. Retrieved 2016-02-07. ^ Pure genius: the inventor's hall of fame. Independent.co.uk (2008-02-22). Retrieved on 2011-01-03. ^ "John Deere War Hero's Recognized for Patriotism". blog.machinefinder.com. Retrieved 2016-02-07. ^ "Agricultural Machinery during the 1940s". livinghistoryfarm.org. Retrieved 2016-02-07. ^ Dl, Esteban (8 December 2017). "Pesados Argentinos: Anexo: Documento radicación industria de John Deere / No pudieron ser: John Deere 720". Retrieved 31 March 2018. ^ Dl, Esteban (13 January 2014). "Pesados Argentinos: John Deere". Retrieved 31 March 2018. ^ Dl, Esteban (25 April 2016). "Pesados Argentinos: John Deere 445". Retrieved 31 March 2018. ^ Dl, Esteban (9 August 2015). 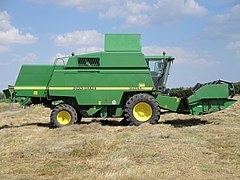 "Pesados Argentinos: John Deere 730". Retrieved 31 March 2018. ^ Dl, Esteban (15 June 2015). "Pesados Argentinos: John Deere 1420". Retrieved 31 March 2018. ^ Dl, Esteban (15 June 2015). "Pesados Argentinos: John Deere 2420". Retrieved 31 March 2018. ^ Dl, Esteban (15 June 2015). "Pesados Argentinos: John Deere 4420". Retrieved 31 March 2018. ^ Dl, Esteban (30 January 2015). "Pesados Argentinos: John Deere 2330". Retrieved 31 March 2018. ^ Dl, Esteban (30 January 2015). 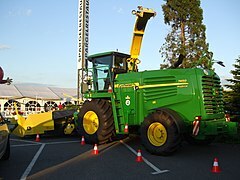 "Pesados Argentinos: John Deere 2730". Retrieved 31 March 2018. ^ Dl, Esteban (30 January 2015). "Pesados Argentinos: John Deere 3330". Retrieved 31 March 2018. ^ Dl, Esteban (29 January 2015). "Pesados Argentinos: John Deere 3530". Retrieved 31 March 2018. ^ Dl, Esteban (29 January 2015). "Pesados Argentinos: John Deere 4530". Retrieved 31 March 2018. ^ Dl, Esteban (31 December 2014). "Pesados Argentinos: John Deere 2140". Retrieved 31 March 2018. ^ Dl, Esteban (31 December 2014). "Pesados Argentinos: John Deere 3440". Retrieved 31 March 2018. ^ Dl, Esteban (31 December 2014). "Pesados Argentinos: John Deere 3540". Retrieved 31 March 2018. ^ Dl, Esteban (13 March 2016). 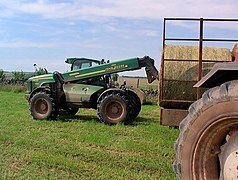 "Pesados Argentinos: John Deere 3550". Retrieved 31 March 2018. ^ Dl, Esteban (13 January 2014). 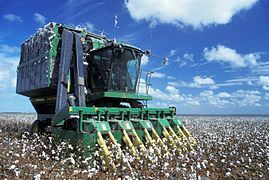 "Pesados Argentinos: John Deere fabricados en el país". Retrieved 31 March 2018. ^ Dl, Esteban (23 April 2017). "Pesados Argentinos: John Deere 570 A / B". Retrieved 31 March 2018. ^ Dl, Esteban (11 December 2014). "Pesados Argentinos: John Deere 544 A / B". Retrieved 31 March 2018. ^ Dl, Esteban (1 April 2015). "Pesados Argentinos: John Deere 200". Retrieved 31 March 2018. ^ "A Big Day for Deere" (PDF). The Plowshare. 14: 1–6. 27 March 2009. Retrieved 2016-02-07. ^ Peter Easterlund. 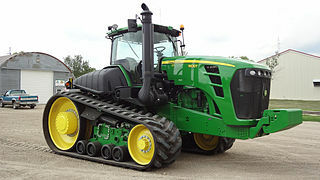 "TractorData.com John Deere 4010 tractor information". tractordata.com. ^ "John Deere 4010". agriculture.com. ^ "Show me the rotaries". Farm Industry News. 1999-07-01. Retrieved 2017-10-17. ^ "Hit by weak crop prices Deere to lay off 600 manufacturing staff". Chicago Chronicle. 15 August 2014. Retrieved 2014-08-15. ^ "John Deere worldwide" (PDF). Retrieved 31 March 2018. ^ "John Deere unveils latest all-electric tractor prototype for zero-emission agriculture". Electrek. 5 December 2016. Retrieved 5 December 2016. ^ "John Deere History". www.deere.com. Retrieved 2015-04-06. 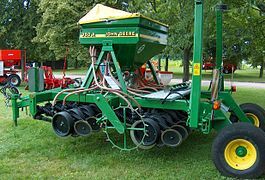 ^ "Deere to advance machine learning capabilities in acquisition of Blue River Technology". PR Newswire. Deere & Company. Retrieved 11 October 2017. ^ Sydell, Laura (2015-08-17). "DIY Tractor Repair Runs Afoul Of Copyright Law". npr.com. Retrieved 2015-08-31. And the little computer screen lets him know when something is wrong. Unfortunately, Alford isn't allowed to fix it. John Deere has a digital lock on the software that runs his tractor. And it won't give him the key. [...] The company went on to say that unqualified individuals could endanger customer safety. ^ Wiens, Kyle (21 April 2015). "We Can't Let John Deere Destroy the Very Idea of Ownership". Wired. Retrieved 2015-04-27. ^ Rudolphi, Josie M.; Campo, Shelly; Gerr, Fred; Rohlman, Diane S. (May 2018). "Social and Individual Influences on Tractor Operating Practices of Young Adult Agricultural Workers". Journal of Adolescent Health. 62 (5): 605–611. doi:10.1016/j.jadohealth.2017.11.300. ISSN 1054-139X. ^ Irwin, Amy; Poots, Jill (12 Apr 2018). "Investigation of UK Farmer Go/No-Go Decisions in Response to Tractor-Based Risk Scenarios". Journal of Agromedicine. 23 (2). doi:10.1080/1059924X.2017.1423000. ^ Nosowitz, Dan (24 July 2017). "John Deere Is the 5th Largest Agricultural Bank in the Country". Modern Farmer. Retrieved 28 July 2017. 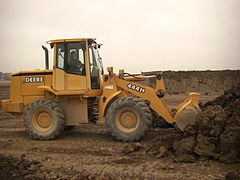 ^ John Deere Reman Homepage Archived 2009-07-24 at the Wayback Machine. 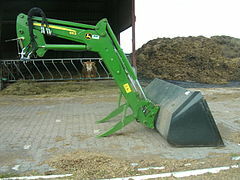 Deere.com (2009-03-20). Retrieved on 2011-01-03. ^ John Deere Credit Archived 2008-12-09 at the Wayback Machine. Deere.com. Retrieved on 2011-01-03. ^ Deere Reaches Agreement for Sale of Wind Energy Business Archived 2010-09-03 at the Wayback Machine. 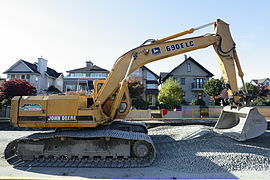 Deere.com (2010-08-31). Retrieved on 2011-01-03. ^ "John Deere - SEC Filings". investor.deere.com. Retrieved 2018-11-07. ^ "George Jones & His Notorious Riding Lawnmower". Saving Country Music. Retrieved 2017-10-17. ^ "Chad Little Sprint Cup All Star race results". Racing Reference. Retrieved 2014-06-09. ^ "John Deere Two-Cylinder Tractor Buyer's Guide". ^ "Standard Catalog of John Deere Tractors 1st". ^ Mary Lou Montgomery. "John Deere heritage runs deep on Missouri farm". Neosho Daily News. Retrieved 2015-06-04. 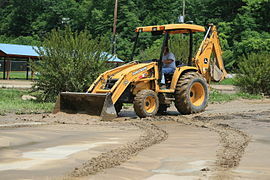 Wikimedia Commons has media related to John Deere. This page was last edited on 18 April 2019, at 19:06 (UTC).